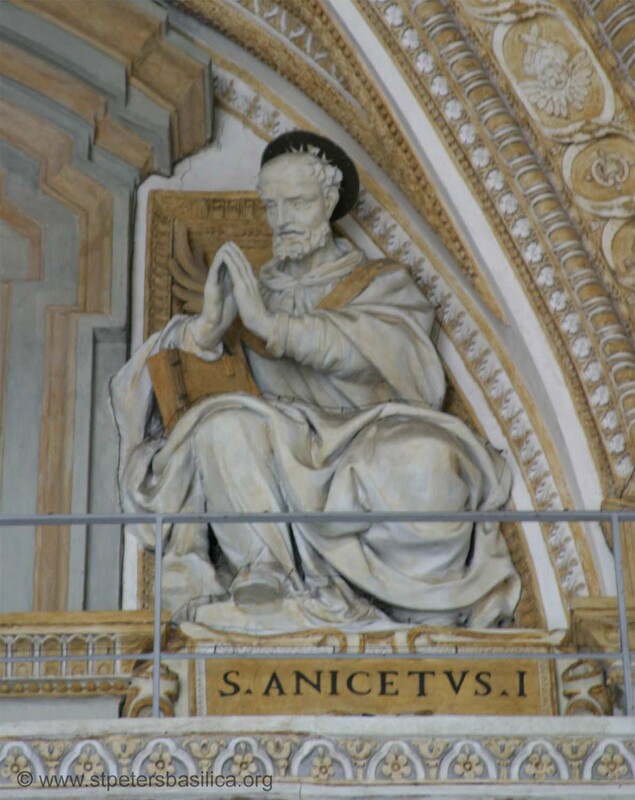 It is said that Anicetus came to Rome with St. Justin Martyr, one of the first Christian apologists. On the martyrdom of Pius I, Anicetus was elected to the bishopric of Rome. He had quite a bit to face. First, the Gnostic heretics, Valentinian and Marcion, were still in Rome, still trying to sell their concepts of the two Gods, the tyrant of the Old Testament and the kind, loving God of the New. Valentinian, who, Tertullian says, planned to become the Bishop of Rome but never got the chance, was eventually excommunicated. There is no documentation as to who finally did the excommunication, but it seems that St. Polycarp of Smyrna may have done that. At any rate, he moved back to Asia Minor soon after Anicetus became bishop. His followers continued to raise havoc in Rome. Marcion was excommunicated by his own father, the bishop of Sinope. Because the Roman civilians listened so long to the teachings of these heretics, they tended to fall away from the intense teachings of Peter and Paul. Anicetus worked very hard at re- teaching his parishioners. He did make a rule to help distinguish the orthodox presbyters from the long-haired Gnostics: they had to keep their hair short. As the early historian, Hegesippus, wrote, the whole city developed a zeal of sanctity. By the time Anicetus was bishop, very few people were left alive who had ever met any of the Apostles. Polycarp, the elderly bishop of Smyrna, had sat at the knee of St John the Evangelist, and had conversed with others. Many in the East revered him and clung to his every word. In the middle of the second century, the Eastern Church celebrated Easter Biblically, that is, the 14th day of Nisan, as defined as Passover, no matter what day of the week it fell on. The Western Church had already been directed to celebrate Easter on the Sunday. At this time, it was already becoming a straining point between the two segments of the Church. In 160, the old, revered Polycarp came to Rome to discuss this with Anicetus. Eventually, neither would budge and they had to agree to disagree. Anicetus was not going to put the Church at risk by antagonizing Polycarp and his let it alone. But years later, this became one of the dividing arguments that split the Church. Soon after Marcus Aurelius became emperor, he must have noted the lack of worship of the standard Roman gods. A brilliant man in his own right, Aurelius must have known the cause of this behavior. He quickly went to the source, Pope Anicetus, and took him into custody. As inflexible as ever in supporting the orthodoxy of the Church and making known the Good News of Jesus Christ, Anicetus did not alter his beliefs. The good bishop was decapitated quickly. Be pleased to watch over thy flock, eternal Shepherd, and keep it under thy continual protection, through thy martyr and supreme pontiff, blessed Anicetus, whom thou didst establish as chief shepherd of the whole Church. Through Jesus Christ our Lord, Who liveth and reigneth with Thee in the unity of the Holy Ghost, one God Forever and ever. R.Amen. We have offered thee our gifts, and now we pray thee, Lord, graciously to enlighten thy Church, so that everywhere thy flock may propser, and its pastors, under thy guidance, be truly pleasing in thy sight. Through our Lord Jesus Christ Thy Son our Lord, Who liveth and reigneth with Thee in the unity of the Holy Ghost, one God Forever and ever. R. Amen. We pray thee, Lord, be pleased to guide thy Church which thou hast nourished with heavenly food, so that under thy might sway she may enjoy ever greater freedom and remain steadfast in the fulness of her faith. Through Our Lord Jesus Christ, Thy Son, Who liveth and reigneth with Thee in the unity of the Holy Ghost, one God For ever and ever. R. Amen.